Indie game publisher HeadUp Games are bringing twin-stick shooter Super Treasure Arena over to Nintendo Switch on December 24th. 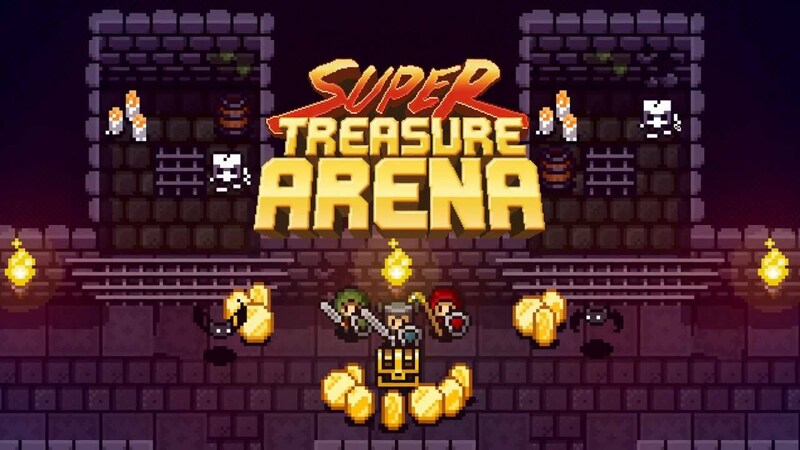 Inspired by retro multiplayer shooter games, Super Treasure Arena has players battle against each other while trying to collect as much treasure as possible. There is also a wide array of enemies to keep players on their toes and drop even more bounty. 5th December 2018, Düren, Germany – Headup announces the retro-inspired arena shooter Super Treasure Arena for Nintendo Switch™. The easy to pick-up twin stick shooter will open its gates for treasure-greedy action junkies on Christmas Eve, 24th December 2018. Super Treasure Arena features competitive play sessions focussing on battling your buddies on the same screen, just like we did many a night with multiplayer gems such as Bomberman. Besides real human enemies and bots, there’s a menagerie of monsters to shake things up and to drop even more coins for you – collect them all! Since there’s no pre-game inventory loadout in Super Treasure Arena, you pick up your weapons on-the-fly. Depending on which you’ll find, you either shoot the hell out of your buddies or try to avoid direct confrontations, first focusing on treasures and smaller monsters. On top of that, each of the five characters has a unique special ability to turn the match around instantly. Either way, you need to grab coins and avoid being blasted by your “buddies”. The action is non-stop and a ton of fun!